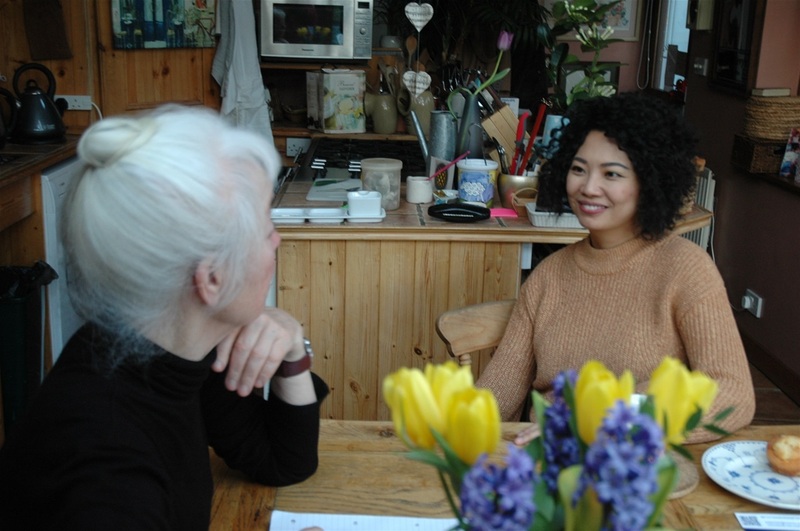 Chinese-born Chenyin Li studied in New Zealand and London before settling to a life as performer, teacher and mother of two in Bishop’s Stortford. Ahead of a recital as part of music@stansted’s current season, she took time to chat with Sonia Levy and Richard Allaway over tea and cakes in Sonia’s Stansted kitchen. We started by asking Chenyin to piece together her life-story so far, and she told us that from college in China, she progressed to studying at university level in New Zealand under Tamas Vesmas, and from there moved on to post-graduate studies with Joan Havill at London’s Guildhall School of Music and Drama, which has produced so many of Britain’s leading musicians over the years. There she met her husband-to-be, Spanish fellow-pianist Iago Nuñez, and came with him when he secured a position in the music department at the Bishop’s Stortford College, which happened also to number on its staff, as a peripatetic piano teacher, Joan Havill’s husband Anthony Hill. Chenyin credits Anthony as a strong and long-term influence in her life, right up until his death in 2016 ended 50 years’ service with the College. So what made the couple decide to make their lives in home-counties England, rather than perhaps Spain or China? “Well, the UK is very much an international music scene – I realised that straightaway at the Guildhall” says Chenyin. And both the educational system and the employment market for musicians are more flexible in Britain than in their home countries. Chenyin has performed in the USA, Spain, France, Holland, China, Germany, Denmark, Italy, Japan and New Zealand while based in Stortford. We talked about the three Chinese Songs which Chenyin will be playing in her Stansted concert, and about Chinese versus ‘Western’ music in general. “At my college in China, there were two separate music departments, one for Chinese music and one for Western. There was no interest in mixing the two in any way; it was one or the other.” We tended to agree with Chenyin’s opinion that very few Chinese composers had yet to achieve a really satisfying fusion of the two musical cultures, but she did hint that she hoped perhaps to record a CD of works by the contemporary composer Gao Ping in the near future. We turned to the subject of the music she has chosen to play in her Stansted concert. Rachmaninoff preludes to start – just because the lady loves Rachmaninoff (as all pianists do, put in Sonia)! Chenyin recalls having to pull over in her car for an hour to listen to Mikhail Pletnev playing music by the Russian giant. Then Beethoven’s ‘Waldstein’ sonata, a work which Chenyin says reveals more and more secrets and subtleties every time she returns to it. After the interval, transcriptions of three traditional Chinese songs, each from a different part of the country, and which Chenyin will talk about on the night. And lastly, an interesting choice: three movements from Stravinsky’s ballet Petrushka. “After the songs evoking rural China, I thought the Petrushka (portraying a 19th-century Shrovetide Fair in Russia) would be a good continuation of the travelogue”. As her two sons grow up, Chenyin is looking forward to being able to devote more time again to public performance, both as soloist and perhaps in chamber music. Despite what she says about her dislike of self-promotion, there seems little chance of her failing to build her already successful career. Meanwhile we are all very lucky to be able to enjoy first-hand the playing of Bishop’s Stortford’s very own international concert pianist! Chenyin Li’s concert in the music@stansted series took place on March 10th 2018 and was a sell-out.